The Rick St. Dennis Sparkle n Glitter challenge has a theme of 'Anything Goes' (with an image from RSD) and an option of 'Hats' if you want to use it. I adore this RSD image "1935 Hat" and thought it would be perfect. 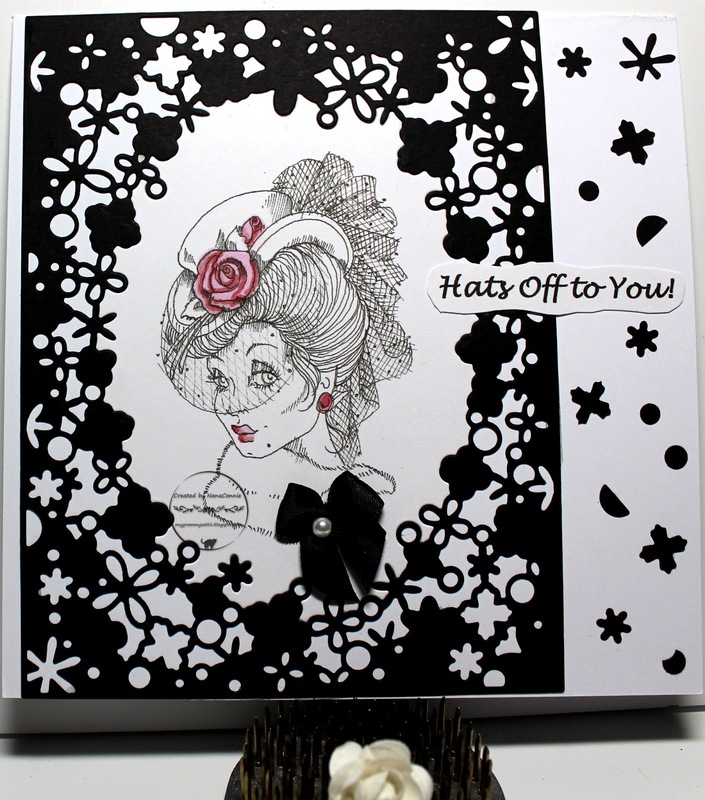 I loved the idea of just black and white with a tiny pop of a single color so I printed the image directly onto the card front, then used my ProMarkers to color only the roses, her lips, and her earring. 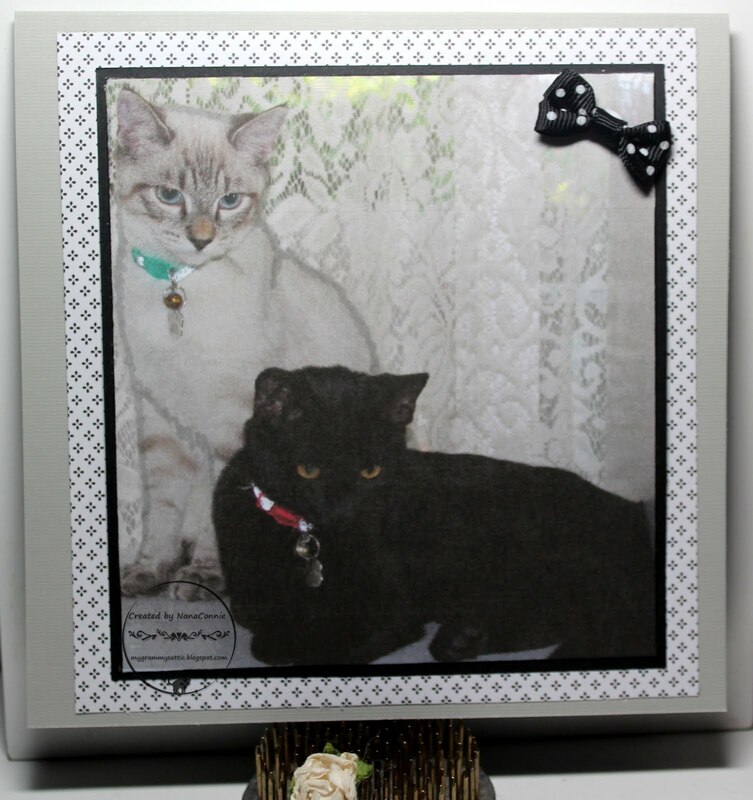 I used one of my Memory Box dies and cut black CS with it, then laid it onto the card front, using it to surround the image with a "frame." 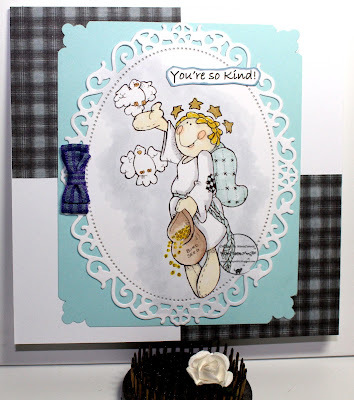 I used a few of the negative pieces from the die cut as embellishment along the right border. Finally, I added the sentiment and a tiny, black ribbon bow with one shiny pearl. Hey, look, a shaped card ! I do those so rarely because, although I love dies, I have very few which work as the overall shape for a card, size being the primary problem. 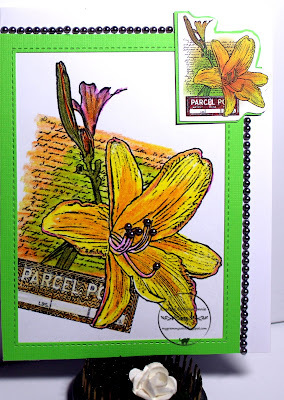 But this is a new-to-me Tonic Studios die set and I couldn't wait to use it. The owl is the current image from the progressive challenge at Limited Runs. I used polychromos pencils and ProMarkers to color him, then die cut the image with a simple circle die from QuicKutz. 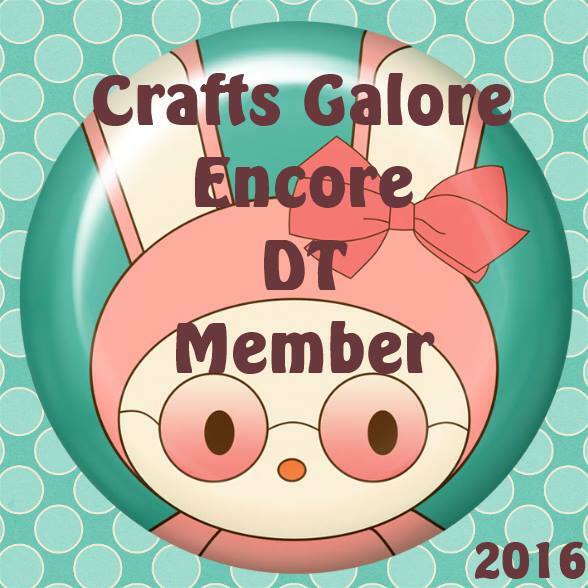 I cut the card shape with the largest die from the Tonic Studios set, just the outer circle. 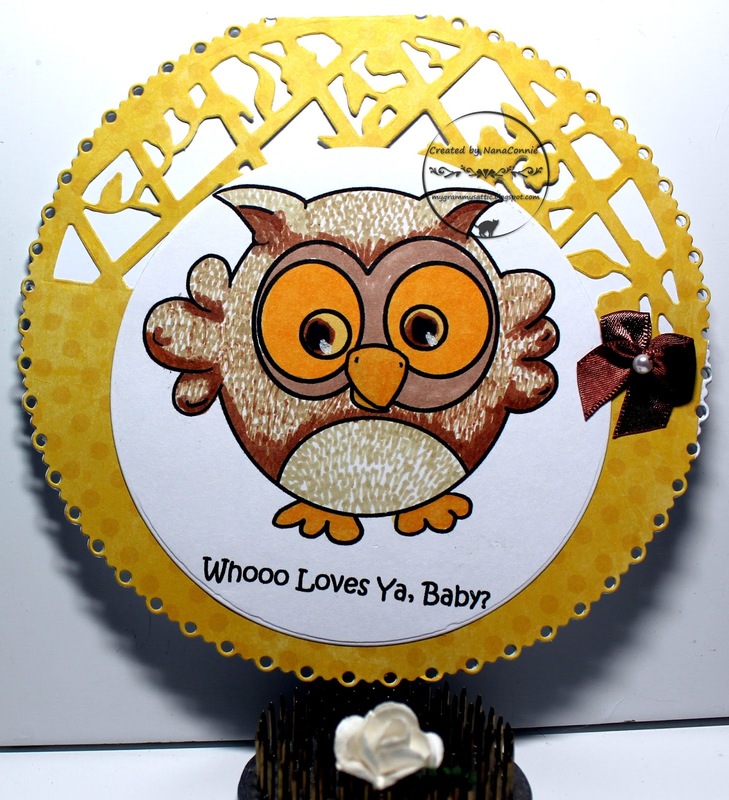 Then I used that same die plus one of the smaller half circles to cut the yellow, polka dot dp which I layered onto the card front. 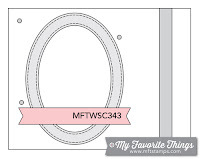 Lastly, I added the image circle and the bow. I wanted to keep it as simple as possible so that the die work would shine. 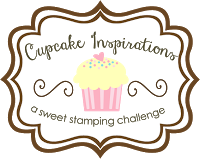 It's Friday again and that means another "Anything Goes" challenge has begun at QKR Stampede. Even though our primary theme is always "Anything Goes" we offer an optional twist if you want to use it. 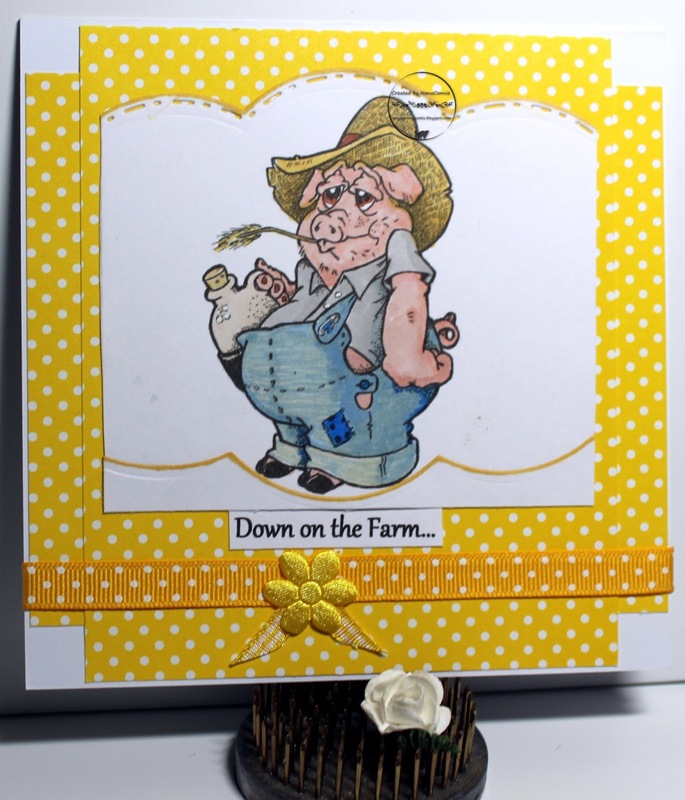 This week, it's "Down on the Farm." I used this fun and funny image from QKR called "Farmer." Farmer Pig (along with his 'moonshine' jug) is colored with ProMarkers, die cut with border dies from Spellbinders and the edges were inked with Promarkers, too. 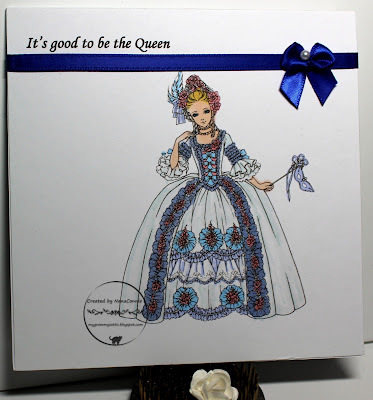 The polka dot paper is from SU and the polka dot ribbon came from Really Reasonable Ribbon. The fabric flower was in my stash and I added a tiny scrap of gingham ribbon to it before layering it onto the other ribbon. 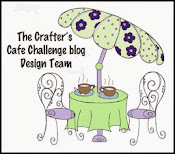 Today I have the honor of being a Guest Designer for the Twisted Thursday Challenge over at the Outlawz. The theme there is always "Anything Goes" but there is usually a twist you can use if you want to enter twice instead of only once. This week the twist is also "Anything Goes." This image (which I used twice in different sizes) is from Rubber City and I colored the two of them with different coloring tools. The larger mage is colored with my polychromos pencils and the smaller one is colored with my ProMarkers. I wanted to see how closely I could match the colors between pencil and marker. I also used my favorite "summer" color combo - golden yellow and green. Why this combo? Because of the warmth of the yellow which says "summer" but offset by the cooler green so that it doesn't say hot, hot, hot the way reds do. For winter combos, I tend toward purple and turquoise. 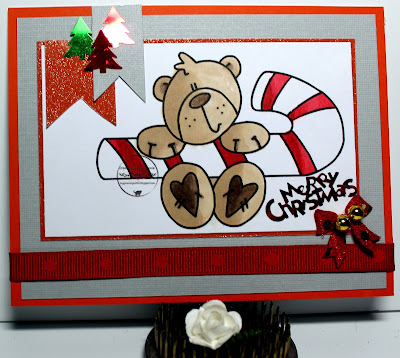 One more Christmas card to share, this time using a gorgeous image from Sparkle n Sprinkle. I took my inspiration from the sketch at My Favorite Things. The image is colored with ProMarkers, with sparkle gel ink on the snow and water. I tore the image piece along one edge for some distressed texture. The snowflake paper is die cut (Sue Wilson die) and laid over a piece of turquoise CS which I had embossed with my "Linen" folder. I added dots of glitter to each tiny snowflake but it's nearly impossible to see it in the photo. I printed the sentiment, hand cut it, and matted it with a scrap of the same CS as the background. 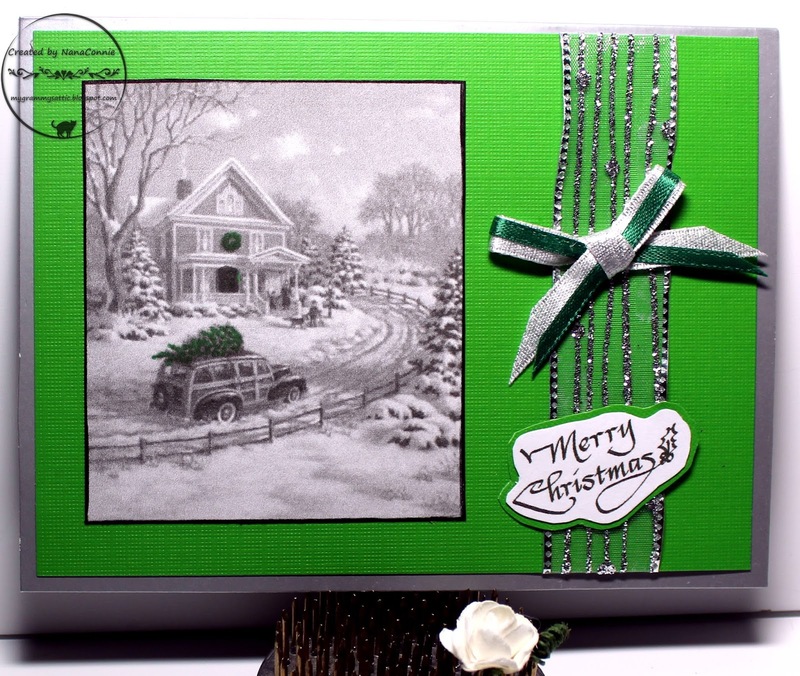 The silver ribbon was in my Christmas stash and I've used a lot of it this month on all my Christmas-in-July cards. I'm still filling in when I'm away by posting other Christmas cards I made with images stamped and sent to me by a friend way back in April. She knew that I was running behind at that point on my New Year's commitment to make 2 cards per month through April and then at least 2 per week through September. As of April 15, I had made exactly none! 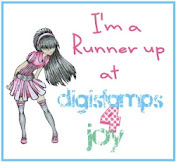 lol So she dug out her rubber stamps, stamped up 8 or 10 Christmas images, and mailed them to me snail mail. That made me feel guilty and I got started right away on coloring and making cards with them. 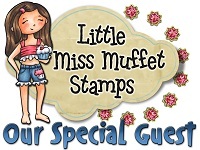 Once again, when she sent them to me, she gave me no info on who made the stamps so I can't give credit. Sorry. This one is colored with a combination of ProMarkers, Copics, and polychromos pencils. I cut it with an unbranded die, then mounted it onto metallic green CS. The sentiment is heat embossed with white EP. Once I finished the coloring, this card came together in 10 minutes. It's a fast, CAS design which will mail easily. 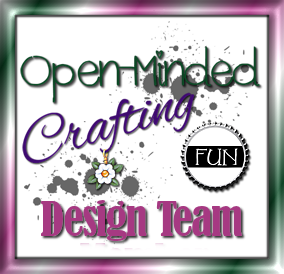 I'm playing with some new dies (Die-versions) which arrived while I was off traveling and, since my daughter had to cancel out on our plans for yesterday, I took the opportunity to see what kinds of creativity they would inspire. What do you think? I love bright colors for summer and I love monochromatic bright colors paired up with dark neutrals. I needed a quick Thank You card and this one came together in about 15 minutes. 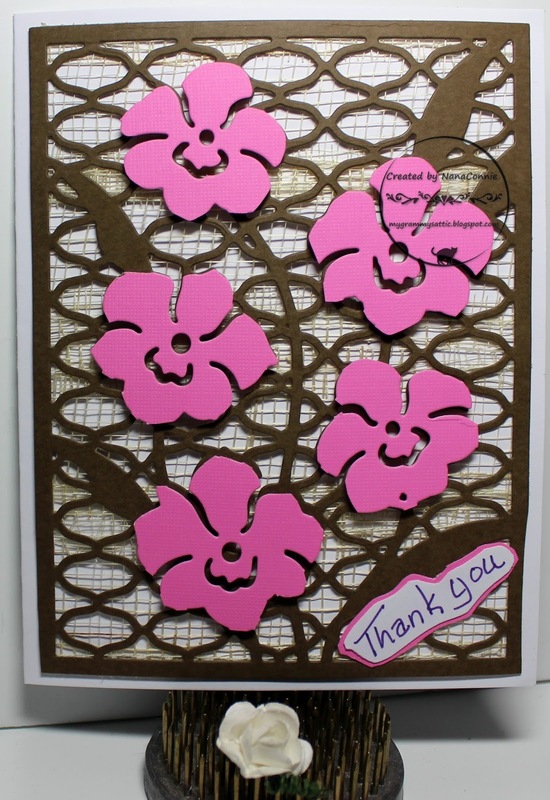 The pink flowers are mounted on Pop Dots and the dark background is layered on top of fiber mesh, which is adhered to a white card front. This is another card done for the "Fur or Feathers" challenge at AuroraWings. 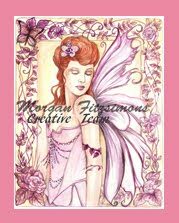 This is one of those cards which took off in an unintended direction but I love the end result. 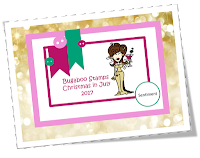 As you may know, I've been on a Christmas card binge this month, influenced by all the "Christmas in July" themes and my own need to get nearly 100 cards made before the Christmas holidays arrive this year. But when I started with this image, I thought I was taking a break from those and working on a birthday or perhaps even an encouragement card. I really didn't intend to have a red and green color combo. 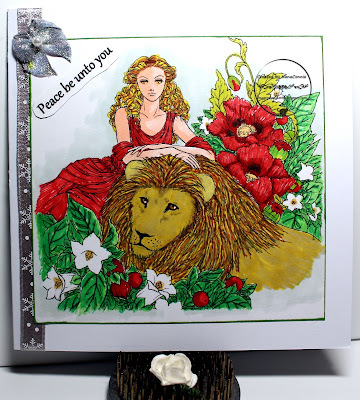 I started by coloring the lion with my ProMarkers and then the poppies seemed to insist on being red poppies. Of course, we had to have green leaves (in various shades) and by the time I finished with all of that, it seemed almost irreverent to add another strong color to the red, green, and gold so the remaining flowers stayed white and her dress joined the poppies in being red. 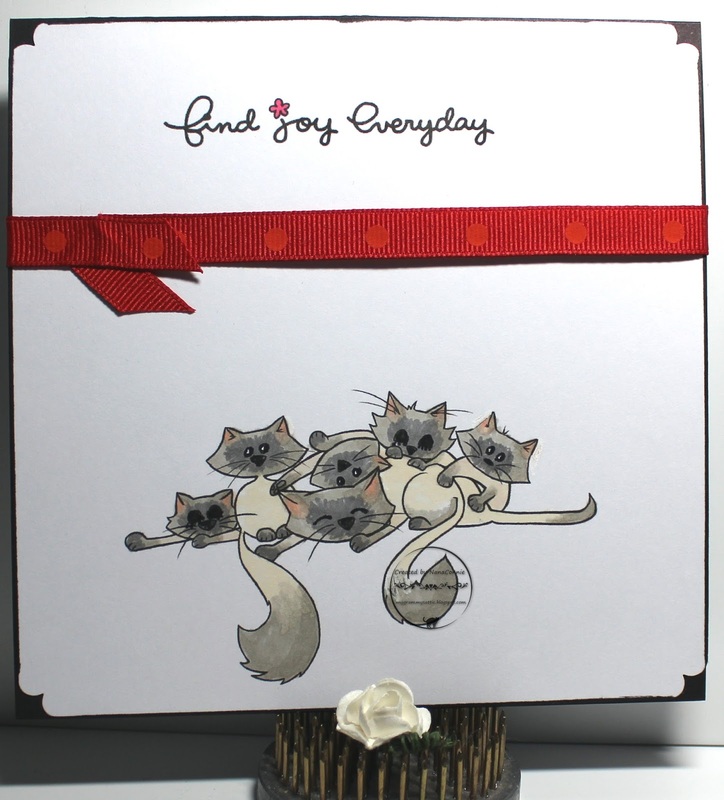 After pondering the card for a bit, I changed my intended sentiment and added the sparkly silver ribbon. I dug out some glittered ribbon and sewed up the bow just for this card. 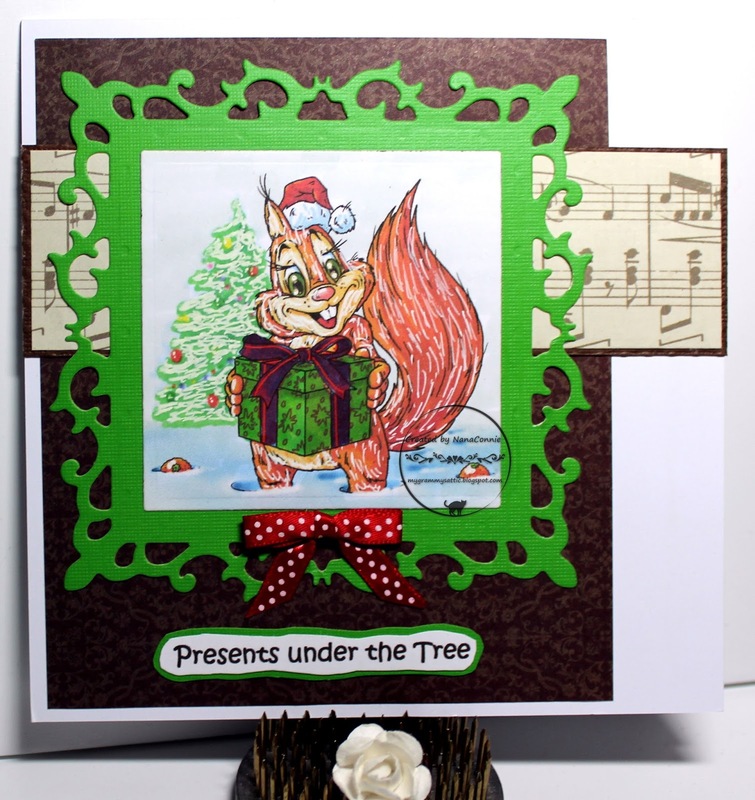 Yep, it had morphed into another Christmas card ! 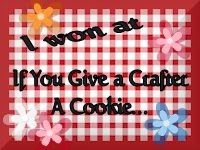 For this one, I used a darling image from AuroraWings. The minute I saw it, I knew I had to color it as a collie puppy. I have a friend who has raised and bred collie show dogs for many years and this will make a perfect card for her this year. 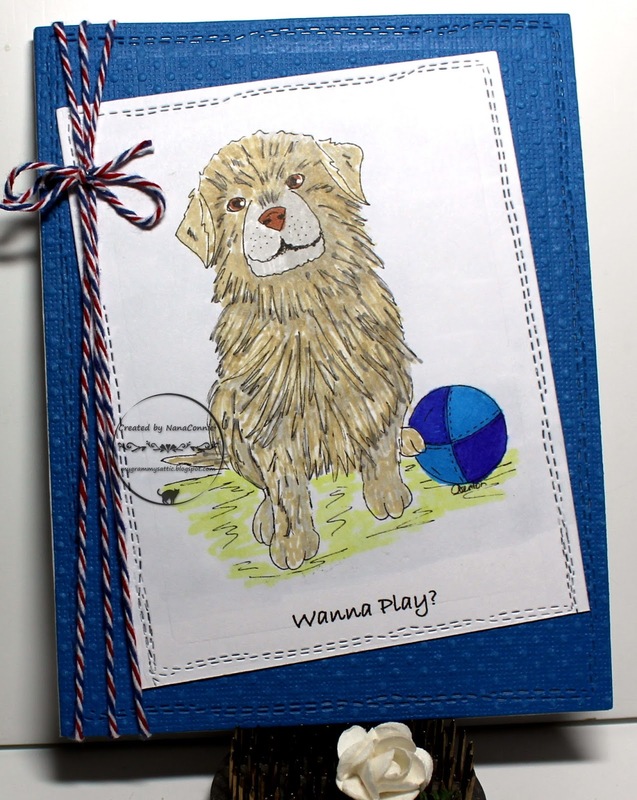 The puppy is colored with ProMarkers, then die cut and framed (die from Spellbinders.) 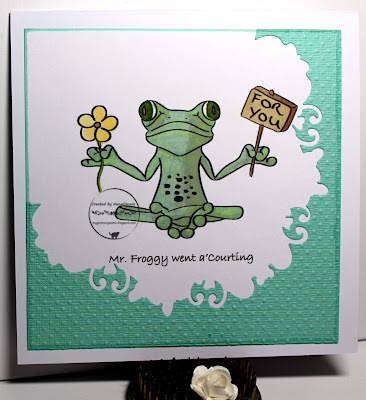 The background is embossed with Swiss Dots. Both ribbons came from my stash and the sentiment is from QKR Stampede, hand cut and matted with a scrap of the embossed CS. This is a small card, only 4" x 4". I colored with my ProMarkers (again!) and then cut the image with a die from Spellbinders. 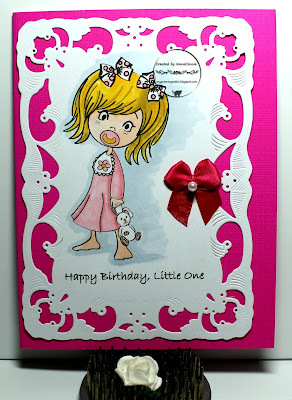 I mounted that onto a pink, pre-made card, and added one small bow for embellishment. Quick, easy, and rather CAS even though it looks much more complex because of the detail in the die cut frame. 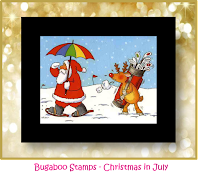 Here it is the 7th Day of the week-long, Christmas-in-July party at Catch the Bug. 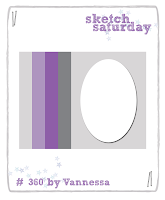 I've played each day and today is Recipe Day: Black, White, or Kraft, plus a Pop of Color and a Bit of Sparkle." 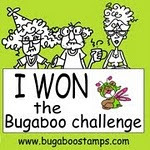 We also had to use the Friday Freebie from Bugaboo Stamps and it's such a fun and funny one. 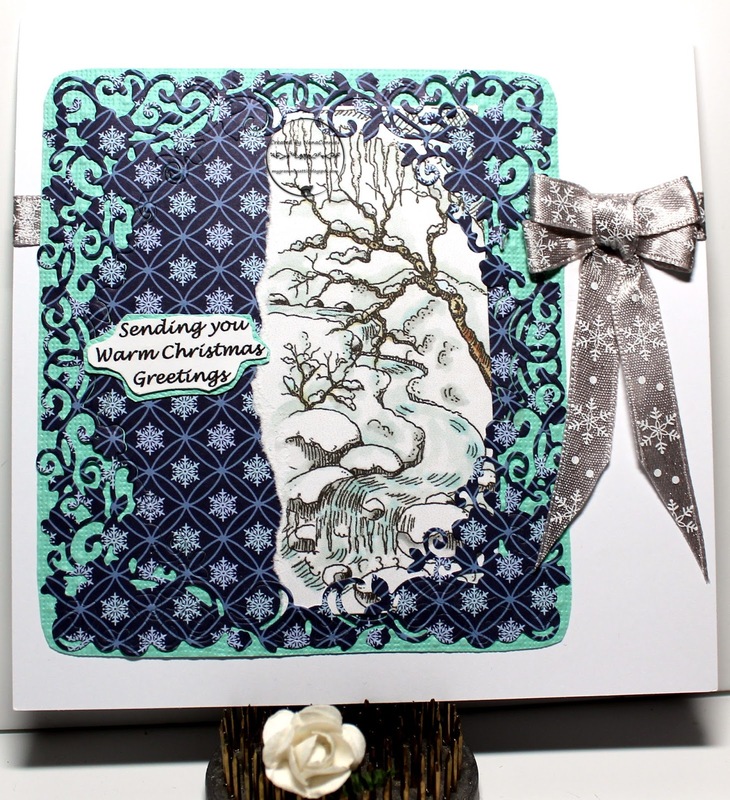 I colored the image with ProMarkers plus sparkle gel ink on the snow and snowflakes, then die cut it with a pinpoint rectangle die from Memory Box. I added a bit of red glitter to the reindeer's collar and I inked the edges with red ink. The red polka dot border was cut with a die from Spellbinders and I added red Stickles for a little more sparkle. Can you tell that I chose 'red' for my pop of color? :-D The white bow is one of those I make ahead of time and have waiting in my stash. Friday once again and a new challenge is starting at QKR Stampede. Our theme is always "Anything Goes" but we offer an optional twist if you choose to use it and today it's "Up, Up & Away" - so, anything that rises up into the sky. 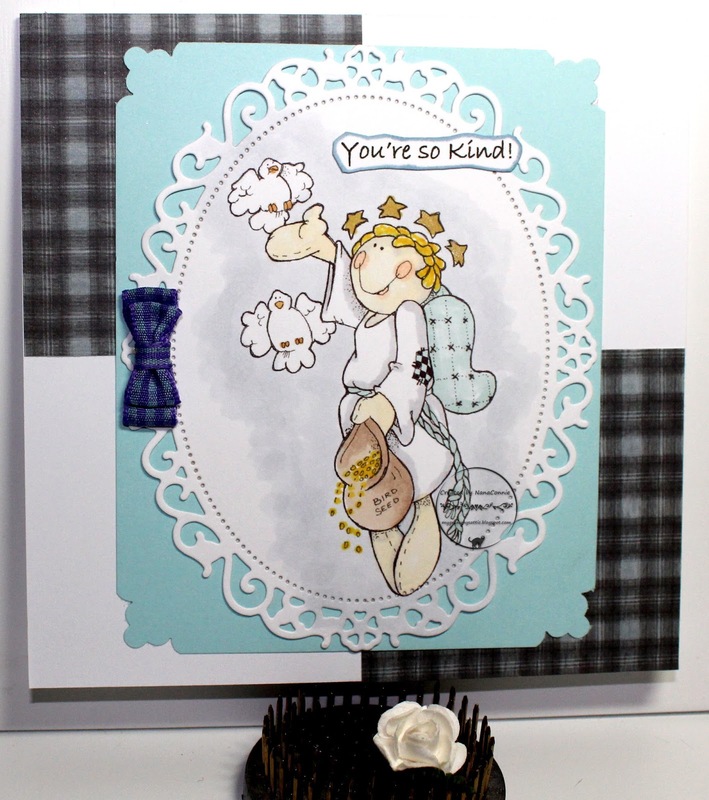 I chose to use one of the sweet angels which can be found in the QKR store and it's called "Bird Feeding Angel." Remember, you can get any of the images at QKR either as digital images or in rubber, which ever is your personal preference. I took my colors from the challenge at Kitty Bee Designs Aloha Friday. I colored this image with my ProMarkers, then cut it with a Spellbinders die. 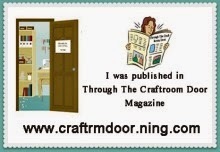 I layered that onto a piece of blue CS, and cut the corners with a punch from Fiskars. The dp came from the "Stone Washed" stack by The Paper Studio. My one embellishment was a double bowtie bow. 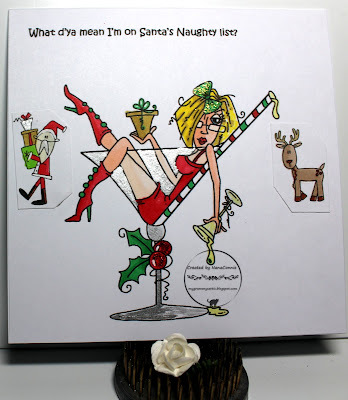 I'm really into doing Christmas cards this week, inspired by all the "Christmas in July" challenge themes, so I found this darling little Mrs. Santa image from The Paper Nest Dolls and did a very quick and simple card. The sentiment is heat embossed with white EP and the red bow is one of those I make by the dozens and toss into my stash for future use. 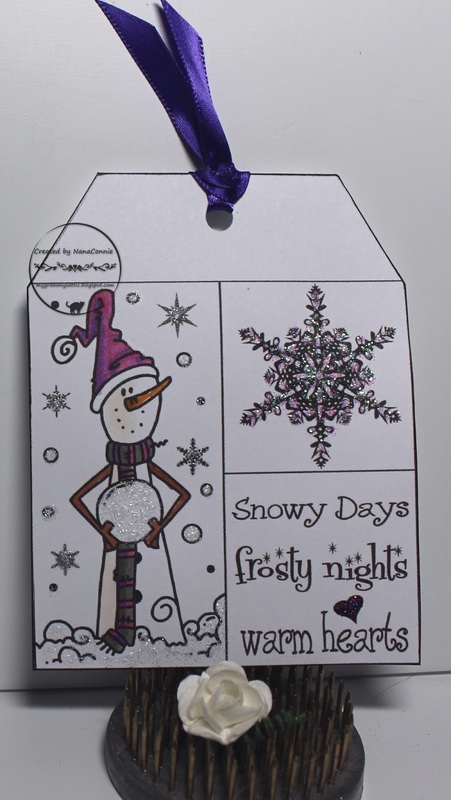 I used ProMarkers and gel ink to color the image, then added Stickles to the first "O" and to each tiny snowflake. I used an unbranded die to cut the image piece and layered it onto some bright pink CS. I used a scrap piece of Bo Bunny dp and a strip of that same pink CS to make my background, then added the image piece. I did a double bow with two grosgrain ribbons and added a button. I've managed to enter each of the daily challenges so far and there's only one more day to go. I have to wait to make that card because it requires us to use the Friday Freebie which won't be available until that morning. 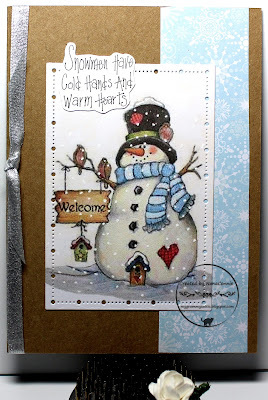 But I have time set aside to get it done so ... All the daily challenges close late on Friday and by that time, I will have done an additional 10 cards for my Christmas stash, some of which were made without the Catch the Bug challenges in mind. Ever wonder how Santa makes his decisions about who goes on the Naughty List? Here's a hint. 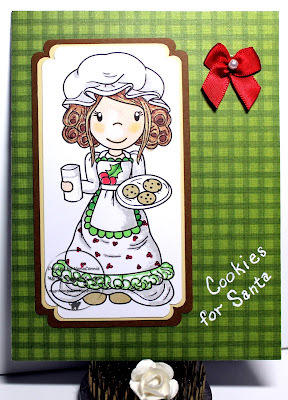 This card is for Day 5 of the daily challenges going on at Catch the Bug's Christmas-in-July all this week. The last two years, I missed out on a few days of the CIJ challenges but this year I'm faithfully entering each challenge throughout the week, which is why you've been seeing double posts all week long. I thought this Bugaboo image was perfect and I've had it in my collection long enough that it qualifies as an "old" image. I think I've used it once before. :-D For today, their theme is based on this inspiration photo and they want to see something humorous, too. I did another really CAS card by printing the main image and the sentiment right onto the card front and then coloring it with my ProMarkers, plus a little sparkly gel ink. 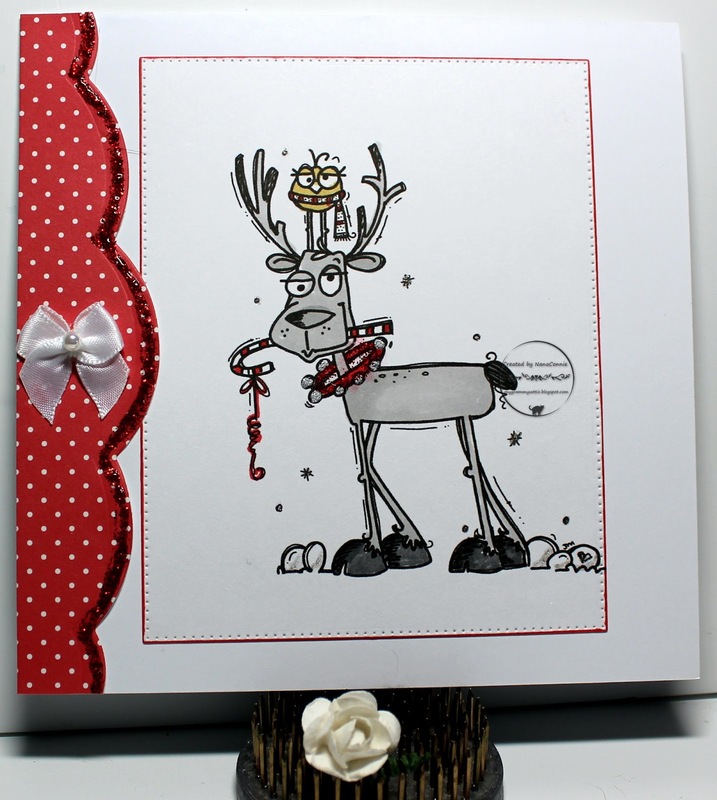 After I had that much done, I realized I could add to both the humor and the inspiration by using a Santa image and a Reindeer image, and I knew I had both in my collection of Bugaboo Stamps. So I found them, made them considerably smaller, colored them, and added them to the card front, but seemingly in the distance. Their expressions were perfect for the sentiment. I'm assuming that little mice would say little "hellos", don't you agree? for my colors. Bright colors are my favorites for anything summer. 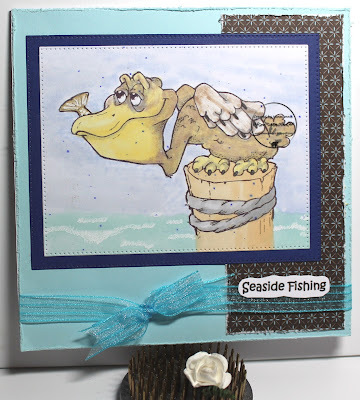 The image is from Toadstool Printables and I colored it with ProMarkers before cutting it with a stitched die from Lawn Fawn. 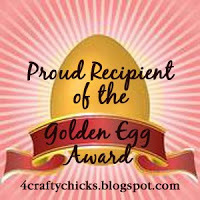 The sentiment was also cut with a Lawn Fawn die but I had to adjust a square die so that it cut a rectangle. I love being able to use dies in ways they weren't originally designed. 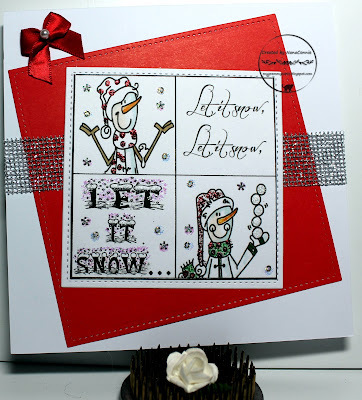 I inked the edges of the image, then found a scrap of red polka dot dp (Stampin' Up) and adhered it directly to the card front, then layered on the image piece. A polka dot bow was all I needed to finish this CAS card. 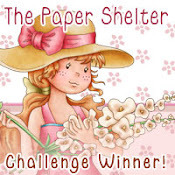 I love all the Fancy Sunbonnet images from Bugaboo Stamps and this one is the freebie last Friday so I was delighted to use it for Day 4 of the Christmas-in-July, week-long, daily challenges at Catch the Bug. I've managed to play each day so far (having missed a few days that last two years they had this) and today is a Bingo Challenge. I used Sparkle/ Bugaboo image/ Ribbon. I colored with ProMarkers and added glitter to the snowflakes, ornaments, stars, and to the holly and berries on her bonnet. I die cut the image with a stitched, scalloped die from Memory Box. I found embossed, sparkly, striped paper in my Christmas stash, cut it with a rectangle die from Spellbinders, and added it to a green card front. 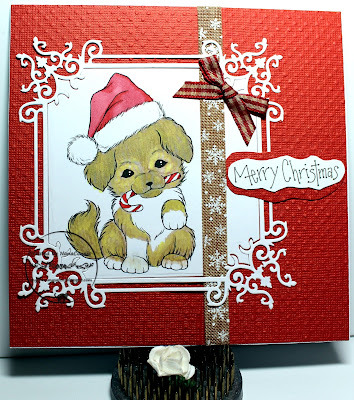 I wrapped red snowflake ribbon around the card front and then layered on the image piece. I tied a triple loop bow using a strip of cellophane paper and my bow maker. Finally, I added three little sparkly candy canes. This one definitely sparkles! 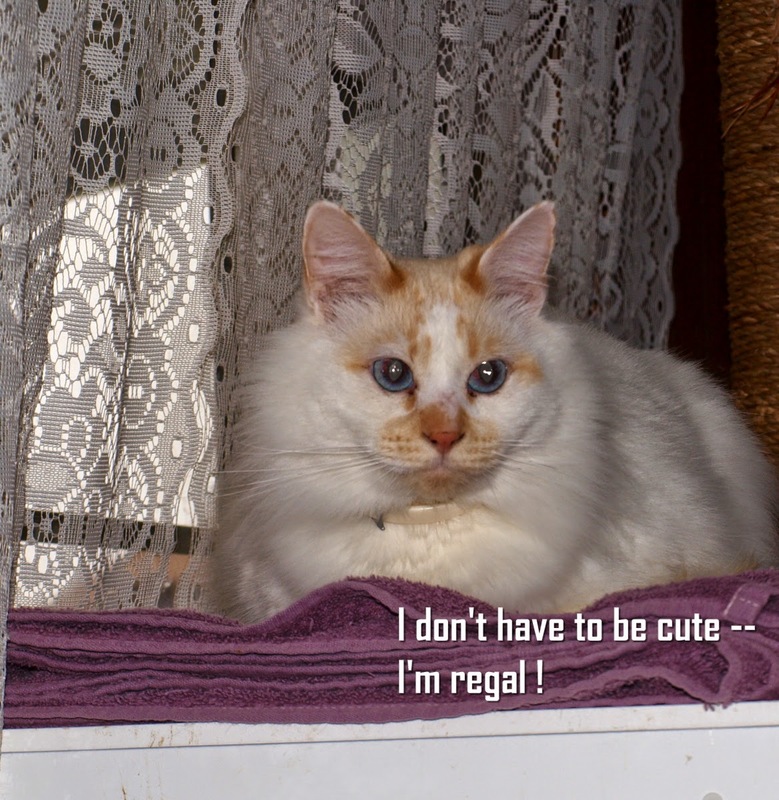 Good to be Queen ! I once had a friend whose favorite phrase was "It's good to be the queen!" and she really meant it. :-D Unfortunately, she lived in the US where there are no titles or royalty. So my phrase was, "It's tough to be queen in America." But working on this image (from AuroraWings) made me think of both those phrases and either would have worked as the sentiment but I went with the kinder, gentler one. 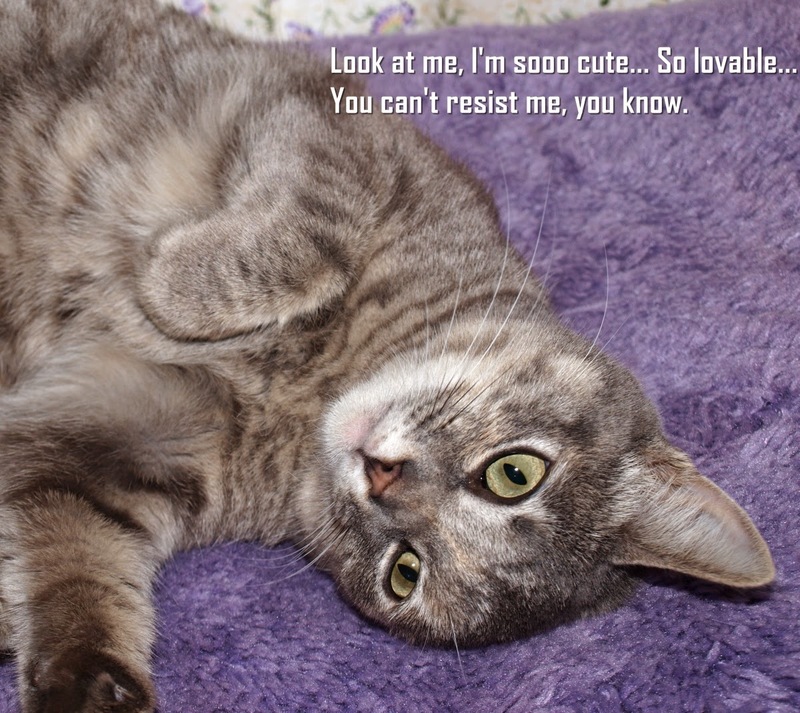 I wanted the card to be as CAS as possible so I printed the image right onto the card front along with the sentiment. I colored her with my ProMarkers and added pale blue chalk to the lightest areas of her dress. I found deep blue, satin ribbon in my stash and tied it around the card front, then added the hand-sewn bow. That seemed to be all it needed so I did nothing further by way of embellishment. 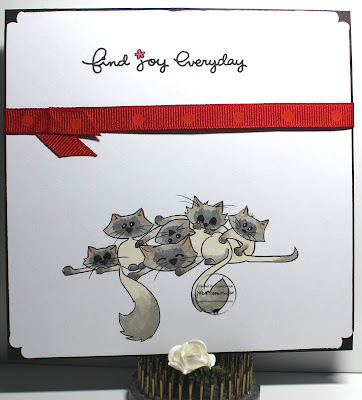 The image and sentiment are printed together and I colored the kitties with my ProMarkers. I cut the image into a 5.5" X 5.5" square and then corner punched it. I had that red ribbon left on the desk from all the Christmas cards I've been doing so I grabbed a piece of it and wrapped it around for a really simple embellishment. I inked the edges, then put the image onto a black card front and called it finished; very CAS. 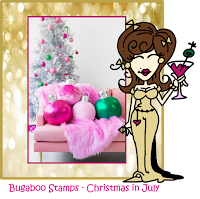 It's now Day 3 at Catch the Bug's Christmas in July challenges and this time they want to see something related to wrapping gifts but in non-traditional colors. Well, for me that always means something in my favorite color - purple! 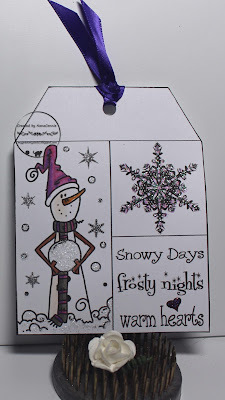 Here's my card-sized, snowman tag made with another Bugaboo Stamps image. I used my ProMarkers to color and, although it's hard to see in the photo, I added glitter to the snowflakes, to the snow on the ground, to the huge snowball, and to the large snowflake above the sentiment. I chose a purple satin ribbon from my stash and tied it through the hole in the tag. Simple, quick and easy. Day 2 of the Christmas-in-July challenges at Catch the Bug and today they gave us a sketch to follow. The teddy bear and candy cane are colored with ProMarkers, then cut with a plain, rectangle die (QuicKutz.) I matted the image with glittered CS and use a scrap piece of it for one of the banner flags. I used gray and red CS for the bottom layers and used a scrap of the gray for the other banner flag. The three little trees are metallic and came from a bag of Christmas confetti. The bells and bow were put together last year and were waiting in my Christmas stash. The sentiment was done with a stamp and then heat embossed with metallic-red EP. The ribbon was from my stash. 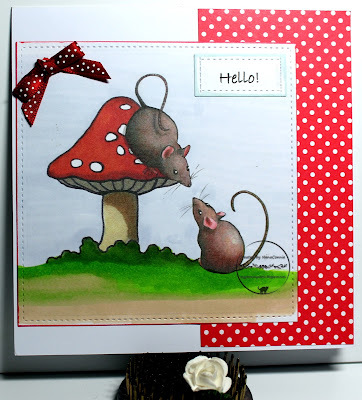 I used ProMarkers and gel ink to color the scene, then cut the image with a simple, square die from Spellbinders. 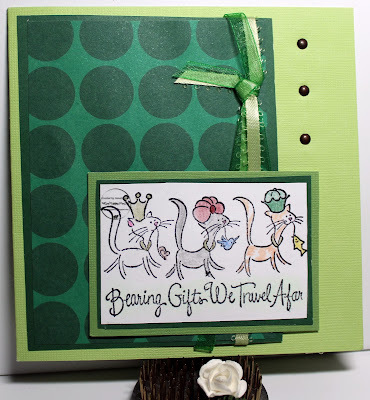 I also cut the green frame with a Spellbinders' die. I found a scrap of sheet music dp, trimmed it to fit the width of the card and matted it with brown CS. Behind that is another scrap of lightly patterned dp (embossed with a folder from Darice) and everything went onto a white card base. 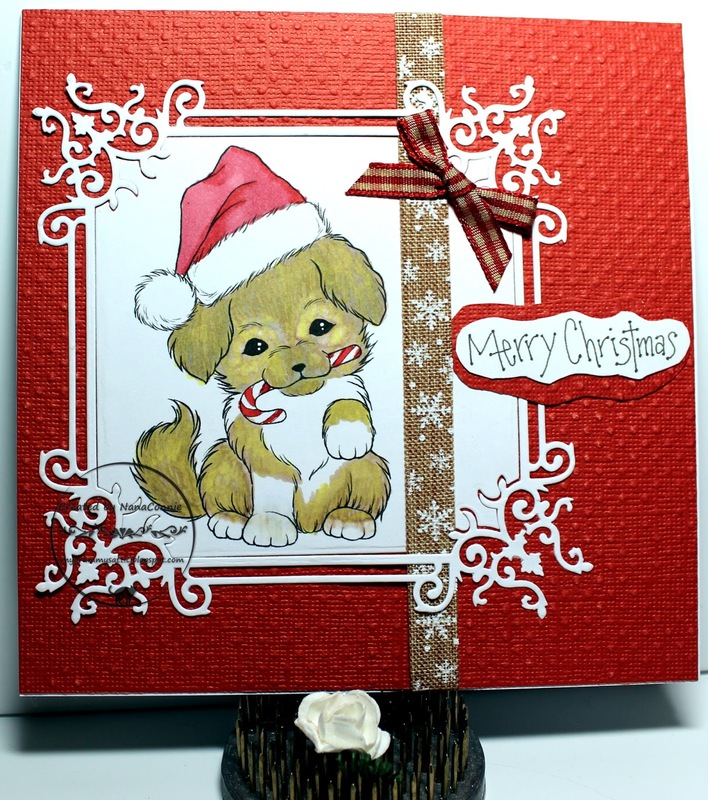 I added the hand-cut and matted sentiment and a red, polka dot bow to complement the red bow on the package in the image. Let It Snow - Sparkles ! OK, I'm home and the weather didn't cool down a bit while I was gone so we're still headed for daily temps over 100 F for at least the next week. Yuck. But Catch the Bug is having their week long, Christmas-in-July challenge (with a different theme for each day) so I'm going to think "snow" and try to play along each day. The last couple of years, I've played in some of the challenges but not each day. This time, I want to do each daily challenge so you're going to see at least 2 posts from me on most days. 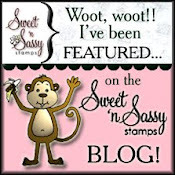 Here's my first one for the Saturday Catch the Bug challenge which requires sparkle. 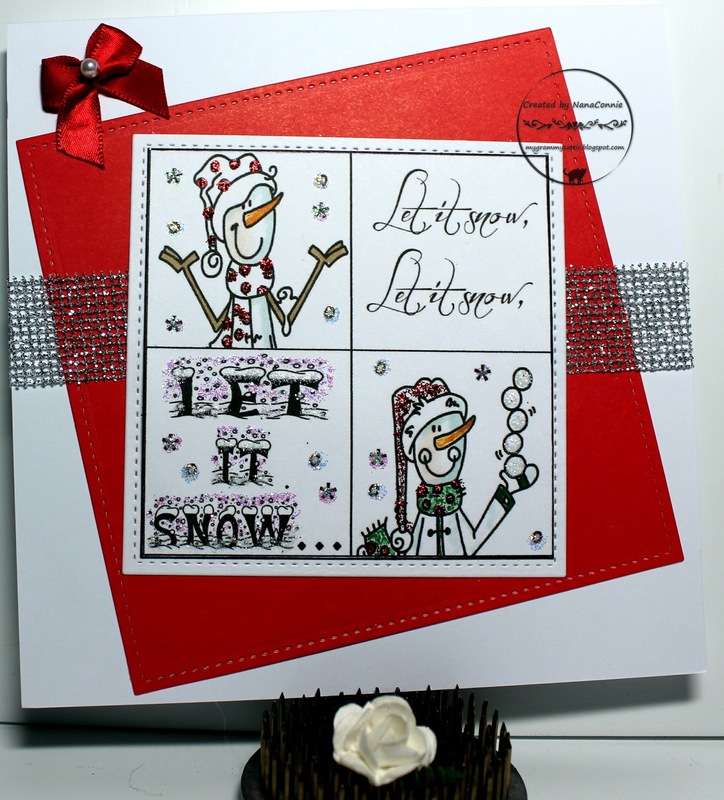 This is one of my older images from Bugaboo Stamps and I colored it with ProMarkers, then added glitter to the snowflakes, to the scarves and stocking caps, to the "Let It Snow" sentiment, and then added Wink of Stella to the stack of snowballs. Quick post this morning since I'm probably sleeping in after a week at the beach. It's exhausting watching all those waves roll in hour after hour, you know. :-D Actually, I got home in the middle of the night and then added this post and toddled off to bed. 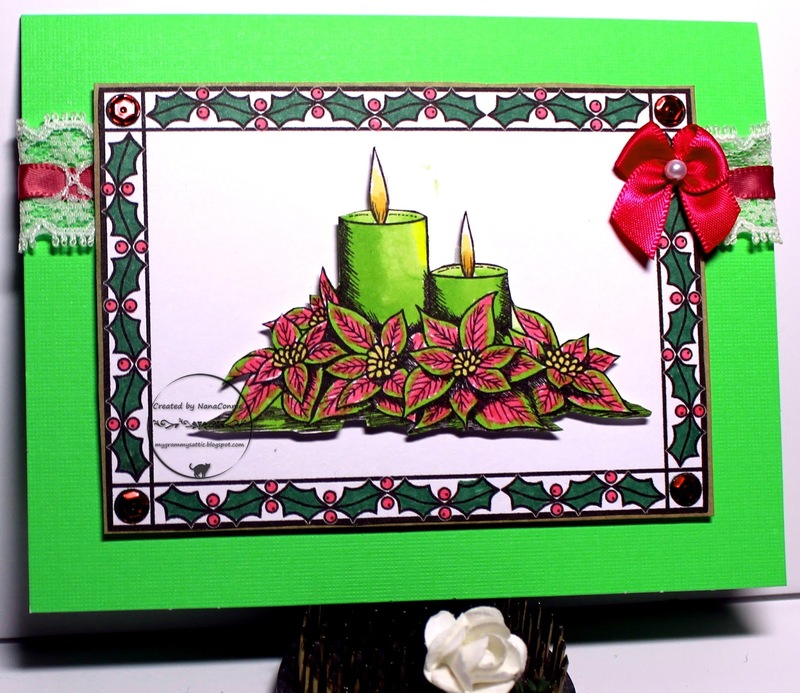 One more card for my Christmas stash with this lovely Poinsettia Candle image from Delicious Doodles. 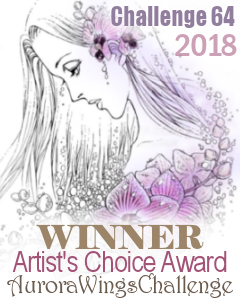 I've had this image for two or three years and I don't think I've used it but now that I realize how lovely it is to color, I'll probably use it at least once each season, maybe more. 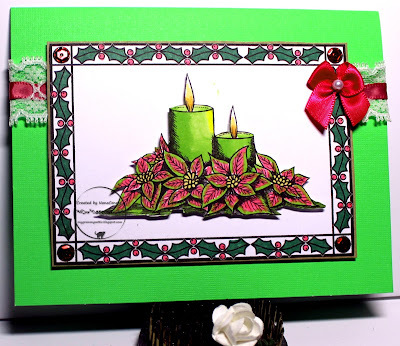 The holly leaf frame is also one from Delicious Doodles. I colored both of the images with Shinhan markers, then die cut the frame with a rectangle die from Spellbinders, and fussy cut the candles before adding them to the frame with dimensional tape. I wrapped lace and ribbon around the card front and layered on the frame, also using dimensional tape. I 'dyed' the bow with ProMarkers so that it would match the ribbon I had woven through the lace. Finally, I added sequins to the frame corners for a bit of sparkle. This photo just doesn't do justice to the dimension or to the sparkle but it was the best I could do and still get this post done before heading off to bed. My card this week uses the QKR image called "Happy Pelican" and this isn't the first time I've used it. 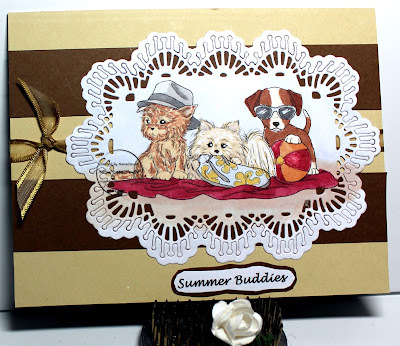 It's just so fun and funny and perfect for any summertime card. I colored with ProMarkers and gel pens, then die cut the image and the frame with pinpoint rectangle dies from Memory Box. The dp is a scrap and I distressed the edges of it with scissors before adding it to the light-blue background. I also distressed all the edges of the background cardstock. I wrapped it with sheer, turquoise ribbon before layering it onto the card front, then applied the hand cut sentiment. Simple, masculine, and fun. I used chalks to color the dog and ProMarkers to highlight his fur and color both the beach ball and the sand. I cut the image with a die from CUT-plorations and also cut the embossed blue background piece with another die from that same set. 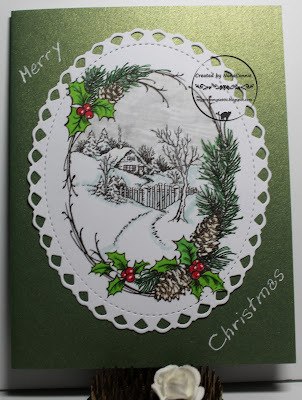 After cutting it, I used my Swiss Dot embossing folder on it. I layered those two pieces together and wrapped them with red, white, and blue baker's twine, tying it into a bow around all three strands. 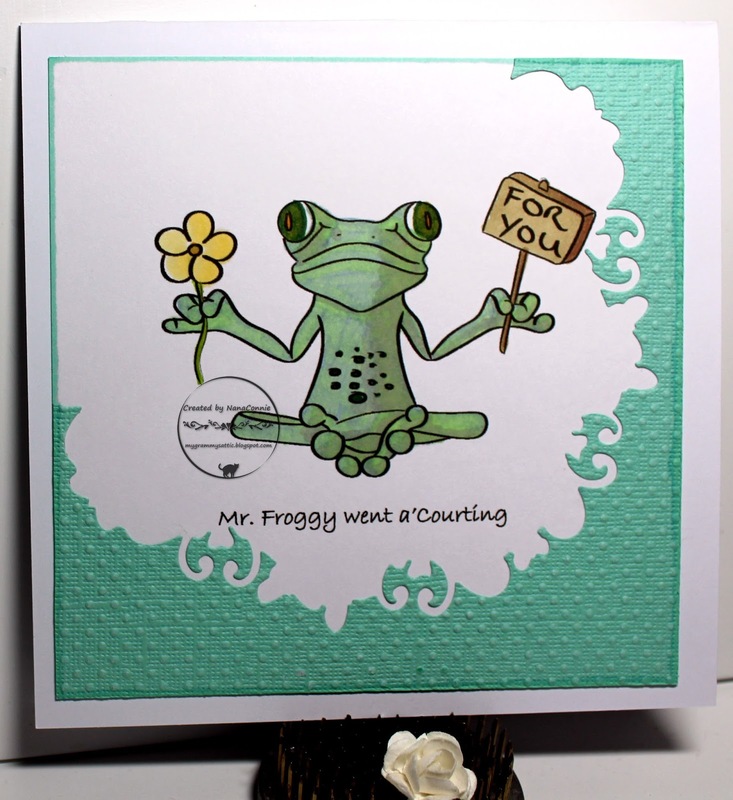 I thought this made a great masculine card so I left it without any further embellishment. Today I've scheduled a post with one of the silliest, most delightful frogs ever seen. 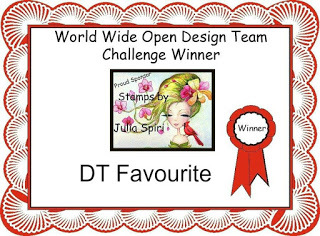 The image is from My Stitch Back in Twine and is available as a freebie for the challenge at Aussie Digital Artists challenge. The image and sentiment are printed directly onto the front of the card, then colored with ProMarkers. I found a leftover outside piece from a die cut I used for another project (Amy Designs die) from which I had already cut and used a corner. Rather than trash the rest of it, I layered it around the image on this card. The open corner looked a bit odd so I took out my ProMarker and a ruler, and inked around the entire thing, making it look like a completely separate piece had been put on the card front. Amazing! The teal paper was embossed for the other project before cutting it so I had some unplanned but great texture on this card. Happy circumstance. My friend who stamped and sent the Christmas images to me (to encourage me to keep my promise to myself about doing Christmas cards all year long instead of waiting til November to start on them) knows me so well! 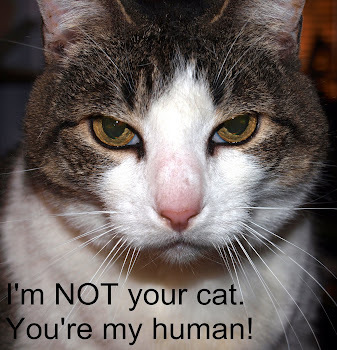 She also shares with me a love of all things feline so she understands the kinds of 'gifts' our fur babies bring to us as a sign of their love and adoration. See below... click on the photo for a larger view. This one was so very simple to make. I colored with my watercolor pencils, cut the image into a rectangle, and matted it with 2 more rectangles. 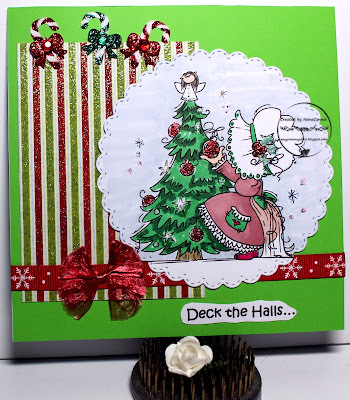 I found the scrap of polka dot dp in my stash of Christmas papers, added it to the front of a lime green card base, and tied two different green ribbons around the card front. I added three metal brads, layered on the image, and pronounced it DONE! Including the coloring, it took less than 30 minutes. Those of you who follow my blog and visit regularly will understand why this particular post is such a perfect reflection of what I'm doing today. lol Yep, I'm at the beach instead of home in the heat. This image is from AuroraWings and I love it! It was fun to color and makes me think of carefree childhood days. I used my ProMarkers to color those darling pups, then cut and embossed it with a dies from Sue Wilson. 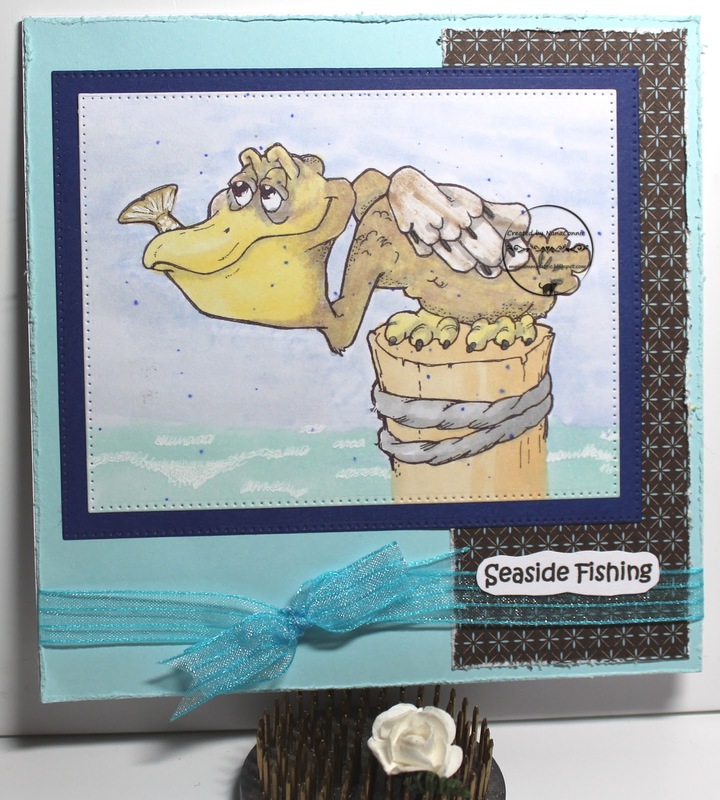 I found scraps of beige and cocoa brown CS, cut them into strips, and made the background for my card. Before adding the image piece, I used satin-edged, sheer ribbon (also a scrap), wrapped it around the card front and tied it with a granny knot. I trimmed the ends into a short diagonal. This lovely Christmas card is based on the sketch from Outlawz. I have no idea where I got this vintage/retro image but it's so lovely in gray scale with just touches of green on the tree and wreath. I had it saved into a folder of digital Christmas images so printed it, adjusted the gray scale to darken it a bit, then used my ProMarkers to color. The sheer ribbon is lined with metallic fibers and the bow is made with two layers of ribbon, green and silver. The sentiment was printed, hand cut, and matted before layering it onto the sheer ribbon. In the meantime, I'll share with you another Christmas card made with a snowman I had colored up who-knows-when and put into the folder where I keep images I've colored but nothing else has been done with them. It was colored so long ago that I don't remember who makes the image. If someone recognizes the image, please leave me a comment and let me know. I'd love to give proper credit. 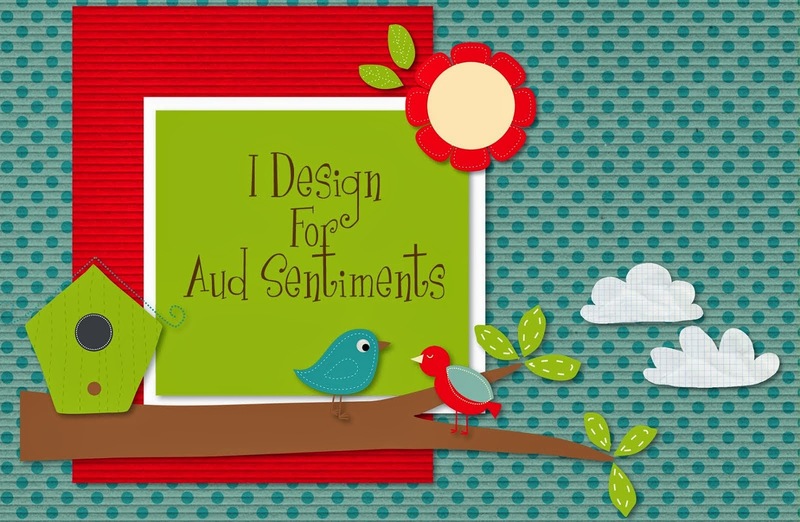 I can tell you that the sentiment came from QKR Designs. Even though the image had been colored (looks like ProMarkers to me), it was still on the original half sheet of CS on which I had printed it so I grabbed one of my Gina Marie dies and cut it. I found a scrap strip of snowflake paper and a length of silver ribbon and used them both on a kraft CS base. I wanted this one very CAS so that's all I did for embellishment.